Try these browser add-ons to access research behind paywalls. Reach an online article you can’t access? The EZProxy Redirect browser extension reloads the current webpage so that if VCU Libraries subscribes to the article or ebook, and you’re a member of the VCU community, you’ll be able to access the full text. Free Chrome add-on powered by a database of millions of legal, author-uploaded PDFs. Search the web for an open access version of a paper, and automatically request a copy from authors when one isn't already available. Common terms adapted from Molly Keener's Open Access Guide from Wake Forest University's Z. Smith Reynolds Library. Public enrichment. Much scientific and medical research is paid for with public funds. Open access allows taxpayers to see and use the results of their investment. Improved education. Open access means that teachers and students have access to the latest research findings throughout the world. Learn more from the SPARC Impact Stories. 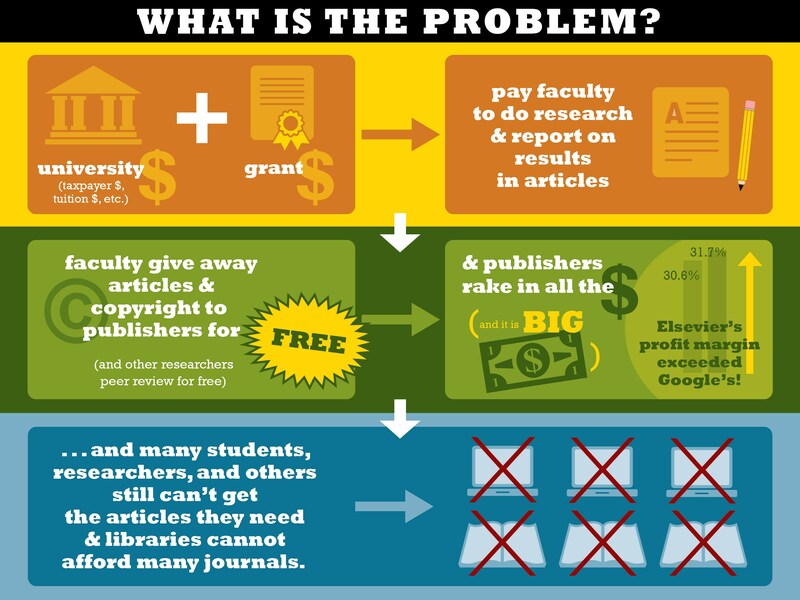 What Problem is Open Access Addressing? used under a Creative Commons Attribution-ShareAlike License.